Expression of human perforin in RBL-1 and RBL-2H3 cells following retroviral transduction. (A) FC detection of WT human perforin and GFP in MIEG3-PRF1 virus–infected RBL-2H3 and RBL-1 cells 48 hours after infection. The sorted cells were a pool of 3 individual transfections. Perforin detection in NK92 cells is shown for comparison. The light green line represents the isotype control. 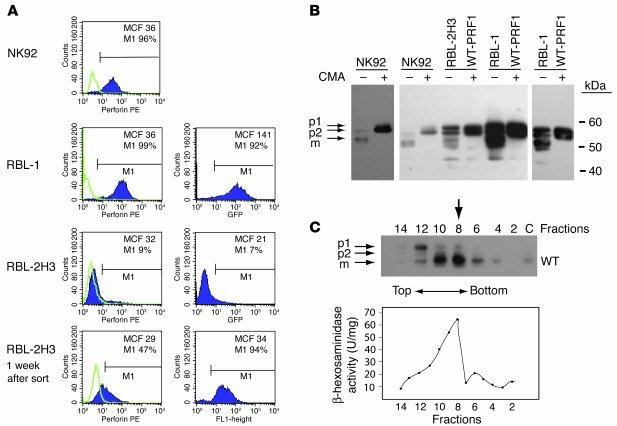 (B) Detection of perforin in NK92 as well as in RBL-1 and RBL-2H3 transfectants by Western blotting following nonreducing SDS-PAGE. Precursor (p1 and p2) and mature (m) forms of perforin were visualized in all 3 cell lines by P1-8 antibody. Equivalent results were seen using H315 antibody. CMA was added to cultures overnight. Fifty micrograms of protein was loaded per lane. Since the endogenous perforin level in NK92 cells is lower than that in the transduced RBL-1 cells, a longer exposure is also shown. For transduced RBL-1 cells, a shorter exposure is also included to display the 2 precursor forms and 1 mature form of perforin. (C) Human perforin was detectable in the granular fraction of RBL-1 cells. RBL-1 cells were disrupted by nitrogen cavitation, and subcellular fractions were obtained after Percoll separation. Fractions 8–10, identified as granule fractions by the peak β-hexosaminidase activity, contained mature perforin (1.5 μg protein per lane). “C” indicates a cell lysate from RBL-1 cells expressing WT human perforin (4 μg protein).